Bird is building her nest. Bird is building her nest. She pushes and pulls twigs into place until she's made a cosy cup, ready and waiting ... can you guess what for? This beautiful picture book is the perfect introduction to forces and the concept of pushing and pulling, and is the third in the new Science Story Book series from Walker Books. 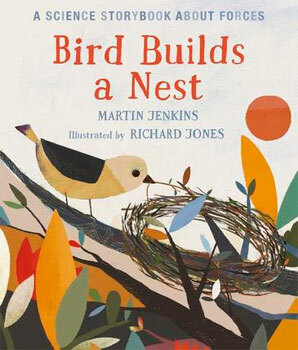 Bird Builds a Nest is illustrated by up-and-coming talent Richard Jones and written by author Martin Jenkins, the award-winning author of Can We Save the Tiger? and Ape. Martin Jenkins has written many groundbreaking non-fiction books for Walker: Can We Save the Tiger?, The Story of Money and Ape to name a few. He has won several awards for his writing including the 1998 TES Information Book of the Year Junior Award for The Emperor's Egg, and he is the re-teller of Don Quixote and Jonathan Swift's Gulliver, both illustrated by Chris Riddell. Jonathan Swift's Gulliver won the 2005 Kate Greenaway Medal. Martin lives in Cambridge. Richard Jones grew up in the Midlands but moved to Devon to study illustration at the University of Plymouth and never went home again. Bird Builds a Nest is his debut picture book for Walker.